This is a one-of-a-kind premier city tour lets you travel the streets of San Francisco in style aboard our authentic Classic Cable Car that lets you disembark at 3 key locations for up close and personal guided walking tours. Your total experience is our #1 goal! You will be treated like a VIP by our professional staff, oh and did we mention this tour offers complimentary blankets and refreshments!? 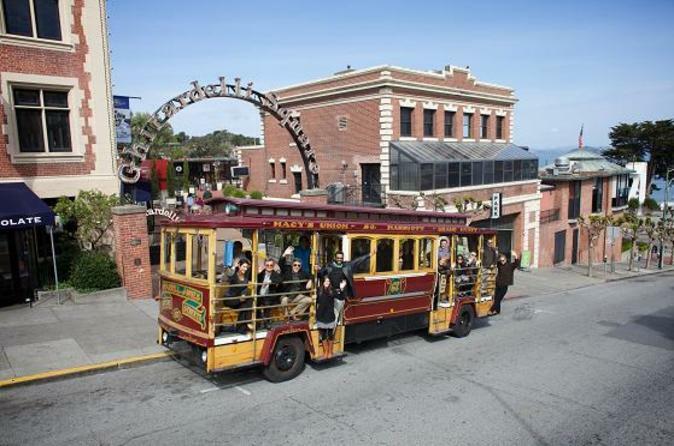 Hop aboard a motorized Cable Car in the heart of Fisherman’s Wharf. As the historical vehicle makes its way down Columbus Street through North Beach and Little Italy, listen to live narration about San Francisco and its notable sights. Cruise through Chinatown, Nob Hill and Union Square on your way to your first stop on the walking tour at Civic center/City Hall. With its Beaux-Arts monument to the City, it showcases the beautiful movement that epitomized the high-minded American Renaissance of the 1880s to 1917. Once aboard the Cable Car again you will head through the lower Haight district on your way to your 2nd stop on the walking tour at Alamo Square Park. You will get the chance to be up close and personal with the world famous "Painted Ladies" as seen in the opening credits on the show Full House! Back on the Cable Car we will head down Fell Street toward our 3rd stop on the tour in the Haight and Ashbury district. You will jump off on Haight Street in the center of the 1960's hippie movement to explore exclusive boutiques, high-end vintage clothing shops, second hand stores, Internet cafés and hip restaurants and bars. Traverse Pacific Heights, one of San Francisco’s most affluent neighborhoods, and take advantage of photo ops as you pass by the home featured in the blockbuster film ‘Mrs. Doubtfire'! Before we drop-off back at the starting point, the historical vehicle makes its way past Ghirardelli Square, home of the namesake chocolates! Keep your cameras ready as you won’t want to miss any of the one-of-a-kind photo opportunities on the San Francisco Experience City Tour!